The last great untold story of World War II, the career of Hitler's "Super Fighter" intended to destroy the RAF in the Battle of Britain -- and why it never succeeded. The super-secret Heinkel He113 "Super Fighter" was said to outperform, outgun and outfight any other aircraft in the world when it entered service with the Luftwaffe in 1940. Luftwaffe chief Hermann Goering declared that the Spitfire was "so much scrap metal". As the Battle of Britain opened the RAF?issued orders to pilots about the new Super Fighter and how to deal with it in combat. Soon reports were coming in thick and fast of desperate battles with the He113 over the Channel and southern England. The Super Fighter seemed to be everywhere, and dozens of pilots fell victim to its guns while others escaped by the skin of their teeth. Yet all was not what it seemed. There was a hidden truth at the heart of the Super Fighter Project that meant that the aircraft would never achieve its potential and so would become Hitler's forgotten secret weapon. 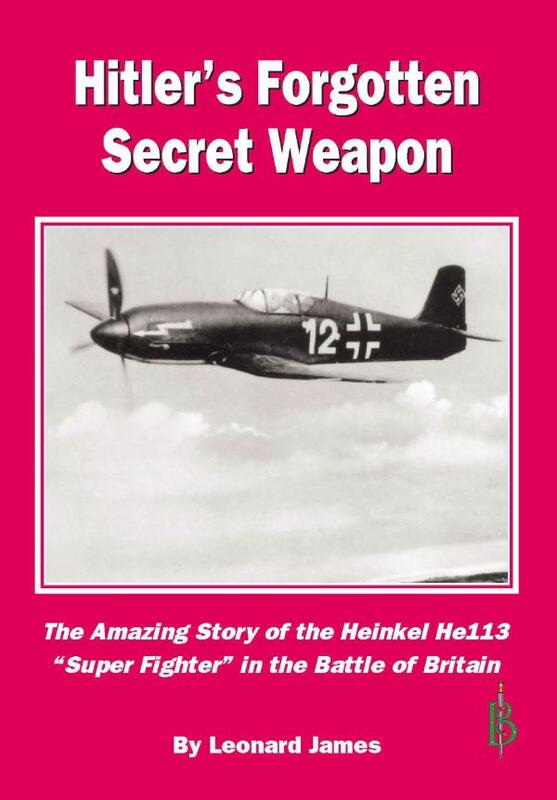 In this fascinating book the author traces the development of the He113 Super Fighter from the drawing board at Heinkel to the war torn skies over Britain in the summer of 1940 -- and to its fall from the skies. At 9am on 14 July 1936 a black car pulled up at the gates to Bentley Priory, a Georgian mansion built in the Italianate style that had been a girl's boarding school until bought by the RAF. In the car was Air Marshal Sir Hugh Dowding. He had just been put in charge of the newly formed RAF?Fighter Command and given Bentley Priory as his headquarters. Dowding was shown around the rambling house and chose his office. None of his staff had yet arrived, but the paperwork had. Dowding's prime task as head of Fighter Command was to defend the air space over Britain in the event of war with a foreign power. By 1936 it was becoming clear that if war came, then Germany was going to be the enemy. If Dowding was to turn Fighter Command into a war-winning organisation then he needed to know everything that he possibly could about the prospective enemy. Unfortunately, as Dowding took his seat in Bentley Priory, that wasn't very much. The Treaty of Versailles that ended the First World War had forbidden Germany to have an air force at all. Intelligence had reported that since coming to power in 1933 the Nazis had begun secretly forming an air force, the Luftwaffe. The key figure in the formation of the Luftwaffe was Herman Goering. Goering had served with distinction in the German air force during the First World War and then become a leading member of the Nazi Party. His prestige was instrumental in persuading Adolf Hitler to divert resources from his beloved army to the newly constituted Luftwaffe. Goering generally preferred to leave the hard work to others, but he had a real talent for spotting the right men for jobs and had a sound grasp of air power that enabled him to set the overall direction and pattern for the Luftwaffe. The formation of the Luftwaffe was, of course, carried out in absolute secrecy. It was a flagrant breach of the Treaty of Versailles and Hitler worried about how other countries would react -- but the Luftwaffe, could not be kept secret for ever. In 1935, the new propaganda minister, Josef Goebbels, came up with a plan. The Luftwaffe would be announced to the world, but in the guise of a purely defensive force. It would be portrayed as a force dedicated to the defence of German air space against invaders. To this end, the announcement in the summer of 1935 that the Luftwaffe existed did not mention bombers, but concentrated on the new fighter the Heinkel He51. Thus when Dowding sat at his desk in Bentley Priory, one of the first documents he read was the assessment from British intelligence of the He51. It did not worry him unduly. The Heinkel He51 was a conventional biplane fighter of a type to be found in all air forces around the world. The frame was constructed of metal while the skin was of stretched fabric. The wings had two aluminium spars, while the fuselage was built around four steel tubes shaped into a rounded form by aluminium and wood spacers. The engine cowling was made of aluminium sheeting and could be easily removed to allow for engine maintenance. The best feature of the aircraft was the BMW?VI engine, a V12 liquid-cooled powerplant that remained the main German air engine until 1938. The performance of the He51 was average for the early 1930s. Nor was the weaponry outstanding, being composed of twin 7.92mm machine guns firing through the nose, and later models were adapted to be able to carry six 22lb bombs in racks below the wings. Dowding knew that his RAF?Fighter Command aircraft easily had the measure of the He51. The Hawker Fury biplane, which the RAF?had in large numbers when the He51 was announced, had a top speed of 223mph, a ceiling of 29,000 feet and a range of 270 miles. Just entering service was the Gloster Gauntlet with a top speed of 230mph, a ceiling of 33,500 feet and a range of 460 miles. Its armament, however, was almost identical to that of the He51 being two 0.303in machine guns mounted in the nose. Another Gloster biplane, the Gladiator, was due to enter service in large numbers in 1937 and was even faster. Moreover, Dowding knew that the RAF had on order three aircraft from a new generation of monoplane fighters that were expected to be the most advanced in the world. The first of these was the Boulton Paul Defiant. The performance of the Defiant was not massively better than that of the biplanes it replaced, but it packed a punch in the form of a gun turret mounted behind the pilot. The gunner could turn his turret to face any direction and pour a devastating fire from four 0.303in machine guns into enemy bombers. The Defiant was due to enter service in late 1939. More impressive was the Hawker Hurricane equipped with no less than eight 0.303in machine guns that were mounted in the wings to fire forward. The aircraft was surprisingly nimble given its high speed and yet proved to be a stable platform when the eight machine guns were fired. The Hurricane was due to start arriving with the RAF in December 1937, and the first order was for 600 aircraft, soon to be massively increased as the prospect of war approached. The swift delivery and large numbers were made possible by the fact that although the Hurricane was of revolutionary design, its construction was traditional. Much of the fuselage was covered in stretched fabric and the internal engineering was straightforward. Rather different was the Supermarine Spitfire.